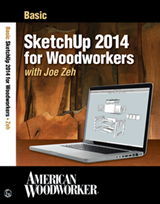 I have taught SketchUp to a large number of students, mostly through my tutorials. Based on feedback I have gotten from them, and conversations I have had with other instructors, it is clear there are two dominant areas students struggle with. 1. The stickiness of SketchUp is stumbling block number one. Anytime two primitives touch they become connected. 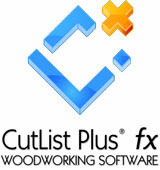 This is useful if those primitives are meant to touch, such as when they are pieces of the same part. But if they are pieces of different parts they create huge problems. 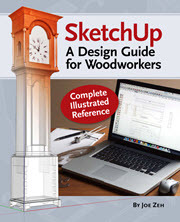 The solution is for students to download and follow the Six Rules for Modeling in SketchUp. I have found that students who follow these rules, particularly Rule 4 – As soon as a part takes 3D shape make it a component, escape this problem entirely. 2. The second largest stumbling block for students is the accidental or intentional violation of Rule 2 – Layer0 (Layer Zero) should always be active when modeling. To see the kind of havoc this can cause see my Primitives, Components & Layers tutorial. To help students avoid this problem I have added functionality to the Layers Management Tool which will warn of a Rule 2 violation. The intent of this functionality is to let a beginner know when he/she is about to change from active Layer0 (Layer Zero) to another layer. By default the new functionality is enabled the first time layers.rb is installed. When enabled layers.rb will monitor the active layer; the layer with the radio button to the left of its name selected. 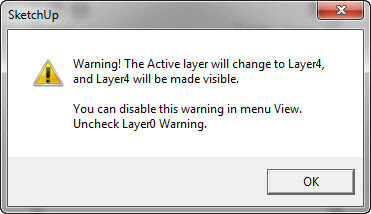 If a layer other than Layer0 is made active, a warning message will appear as shown here. Notice that the message tells you which layer will become active and also how to disable the warning. 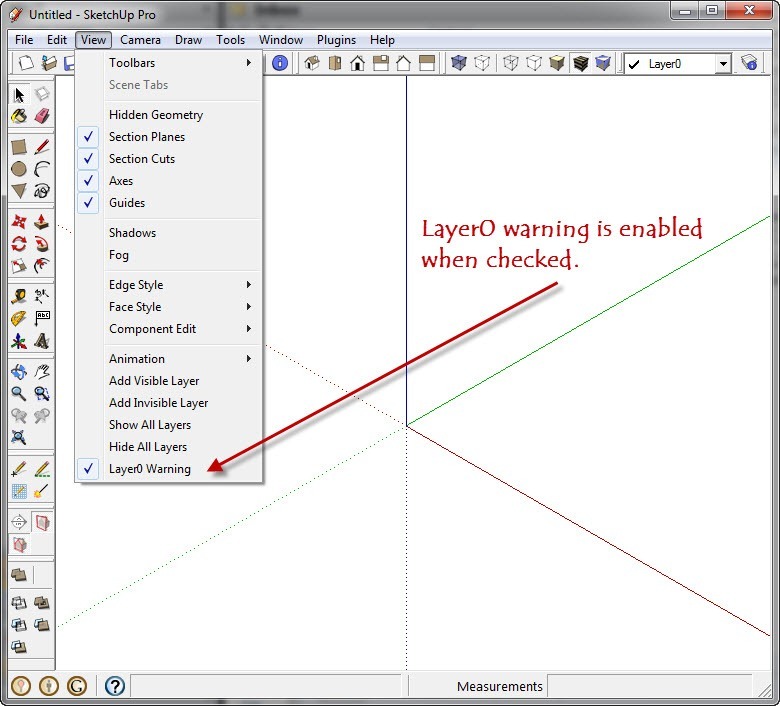 If a layer other than Layer0 is active and then Layer0 is made active, no warning is given because Layer0 is the desired layer for modeling. Under the View menu you should see the following new tool. 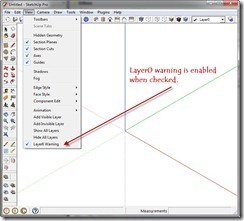 Notice the Layer0 Warning is checked: Layer0 Warning is enabled when checked and disabled when not checked. Also notice the Layer Tools toolbar. You don’t need the toolbar checked in View/Toolbars, but it is a good idea to verify that installation has been completed correctly. Your toolbar will appear where you locate it on your desktop which is likely different than floating in the work area. As mentioned earlier, when you open SketchUp for the first time after installing Layer0 Warning, is enabled by default. From then on the last state of Layer0 Warning will be stored and recalled upon opening SketchUp again. There will be no change in SketchUp behavior until you change to an active layer other than Layer0. Then the warning will appear. 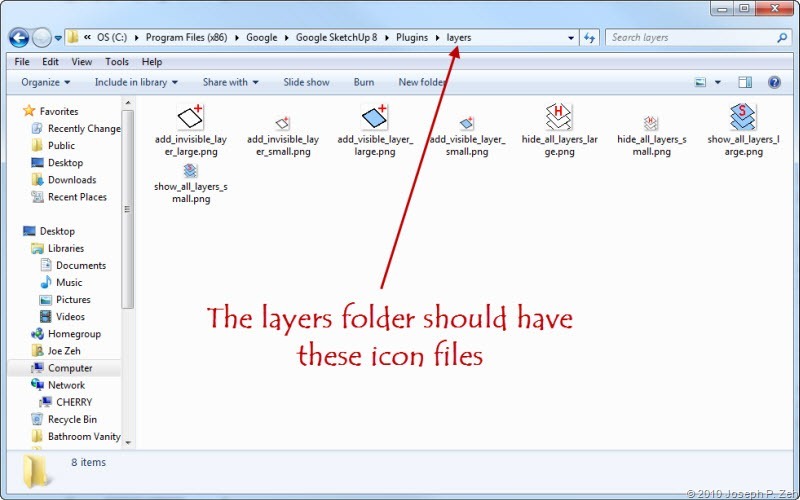 Click OK and the active layer will change to the one you have chosen. The tool makes no attempt to stop you from changing the active layer to other than Layer0, it merely warns you of doing so.